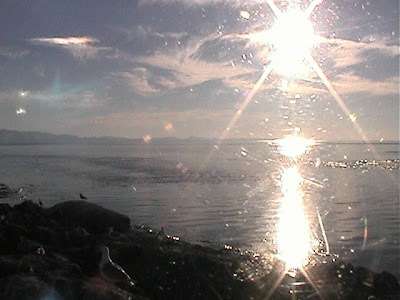 From the webcam I was watching a beautiful autumn sunset and hearing a cacophony of gulls with some sea lions growling and barking in the background. I had to capture the moment to share, and I did so by taking a still image from the web cam and making a recording of the vocalizations through the built-in microphone on my computer (which picked up the sounds off my speakers). I'm trying something new here, using iWeb's podcast feature to try and host my own audio files on a page called "Orca Watcher Sounds". This way, you should be able to go click the above link and listen to the audio clip without having to download a file and open an external application. Hopefully I can upload all my audio files there, and you can listen to any of my posted vocalizations from that one site. Let me know how this works for you! Hi Monika... It worked just fine for me and the clarity was awesome.. Look forward to listening to more sounds of nature... Have a great weekend..
Much easier to listen to that the past audio link. Nicely done and great recording quality. Thanks for experimenting. Michele, The K - thanks for your feedback! Glad to hear I may have found a solution to making the audio more accessible.